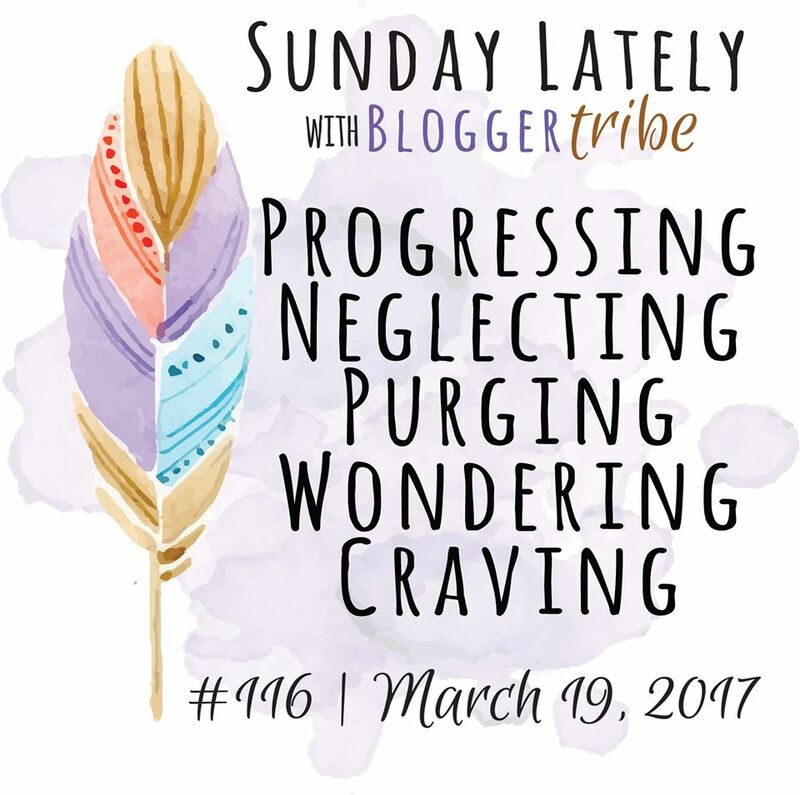 It's been a minute since I caught up with the Blogger Tribe and our weekly Sunday Lately posts! 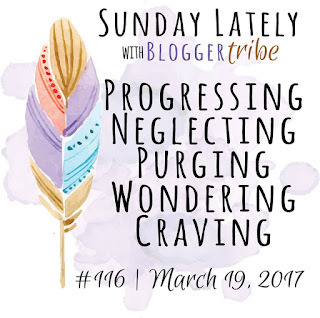 I was in Arizona the past two weekends, so blogging just wasn't happening. PROGRESSING... I finished up some of the DAR awards stuff that I had due this week, and now I'm progressing on some other projects. Finally! Procrastinating got the best of me, but things are starting to come along. NEGLECTING... Clean laundry, 2-3 loads clean and in baskets but not yet put away. I can do laundry all day, but getting it into drawers and closets is just not something I enjoy at all. PURGING... Our old washer-dryer and our old spice containers! Our old set were from 2005 or so, and they were both having issues. So we decided to take advantage of President's Day sales and got new Samsung ones. They have a HUGE capacity (we can wash our comforter now instead of taking it to the dry cleaner!) and so many different settings. They're lovely. They discontinued our old spice organization system, and the jars were falling apart. So I ordered a new system via Amazon. You can't fit a tablespoon into them like my old set, but I like them nonetheless. They stack so nicely and work on our lazy susans. Plus, I got to use my label maker. Being organized makes me so happy! WONDERING... I'm wondering why I was so blue on Thursday and Friday. No good reason to be at all. Ever just get a case of the blues without understanding why you want to eat comfort food, cry, read magazines, do nothing else? Sigh. It happens to me from time to time. CRAVING... Y'all, I'm craving Spam musubi like crazy. 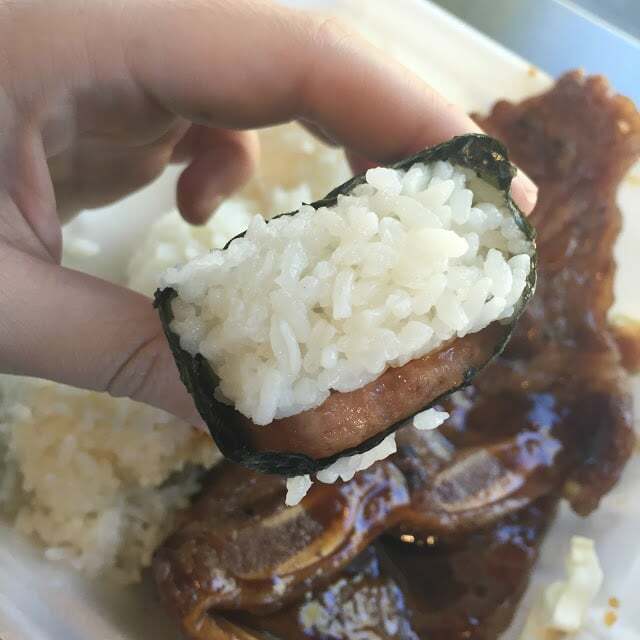 If you don't know what it is, it's basically slices of Spam fried up with teriyaki sauce, wrapped in a little bundle with sticky white rice and held together with some dried seaweed. It's a popular menu item in Hawaii, where I got hooked on it. My Mom would make them for me as a school lunch or a snack. She still makes it for me sometimes when I'm road tripping home from visiting her. I get mine locally at L&L Hawaiian Grill if I'm too lazy to make it myself. It grosses Dan out to no end, but it's just something that I crave as comfort food! I know it's super processed, but it's just a flavor I love. Those are Korean ribs in the background. On Twitter: RT because Ed Sheeran puts us through all the emotions, right? On Pinterest: This deep dish pizza recipe is one of the reasons I'm now obsessed with getting a Lodge carbon steel skillet. On Instagram: Dan made us cottage pie on St. Patrick's Day, and it was delicious! Shopping: On my birthday wishlist: carbon steel skillet in 12" and 15", magnetic Lodge trivet, and a butter crock! The older I get, the more my birthday wish list looks like a wedding registry.